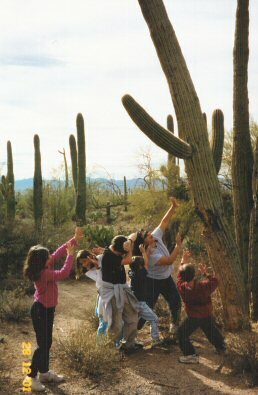 Deep in the Sonoran desert of Arizona, on the outskirts of Tucson, this National Park pays tribute to the largest cactus in the world. Saguaros grow up to 50 feet tall over 200 years, and personify - can I say 'personify' for a plant? Should it be 'cactusify?' 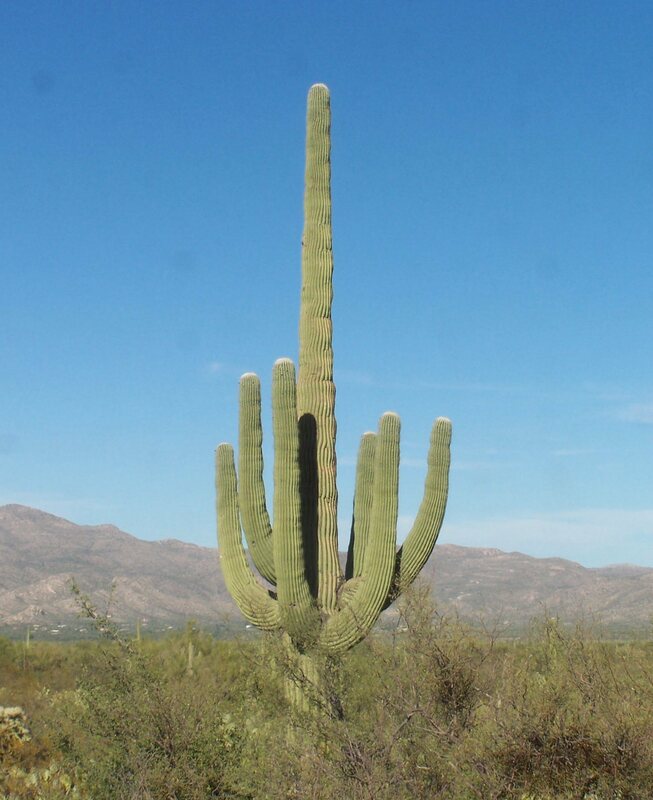 Anyway, saguaros are the epitome of adaptation to the desert lifestyle. They retain water through the driest years and use a network of roots close to the surface to absorb whatever chance moisture comes their way. The Park is much more than cactus, although they are all over the place. It's home to more than 1,000 species of plants, and Douglas fir and Ponderosa pine can be found at the higher elevations. There are hundreds of hiking trails and ancient Hohokam petroglyphs adorn the rocks in this wilderness park. This Park delivers what is promised. On the slopes of the mountains, on the plains of the desert, you'll see saguaros and more saguaros, some tall, some small. If you like desert, if you like cactus and desert birds and desert lizards and small-footed rodents that come out in the cool of the evening, you'll love this park. This was the third Park I visited after the seeds of mania were sown. My family has been remarkably patient, have I mentioned that? 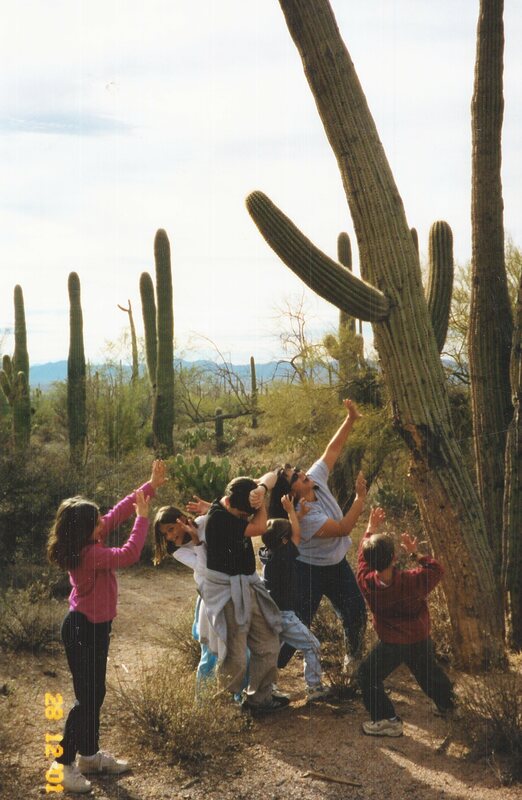 They drove with me through the winding trail with good spirits, but since we live in the desert, seeing such majestic saguaros was nothing new. 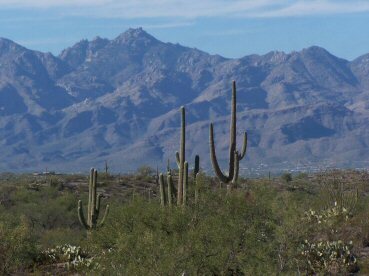 I give it two Subbies, mostly because it delivers what it promises: saguaros (compare this to Fort Bowie, which does not deliver on a fort). We got a stamp, however, and later in the day drove up to Mount Lemon where we played in the snow. I was in shorts. 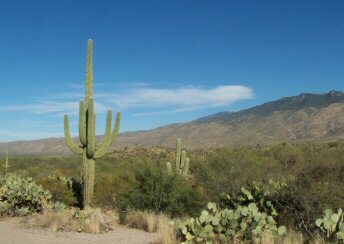 The Park is separated into two components, one west of Tucson, and a much larger one to the east. 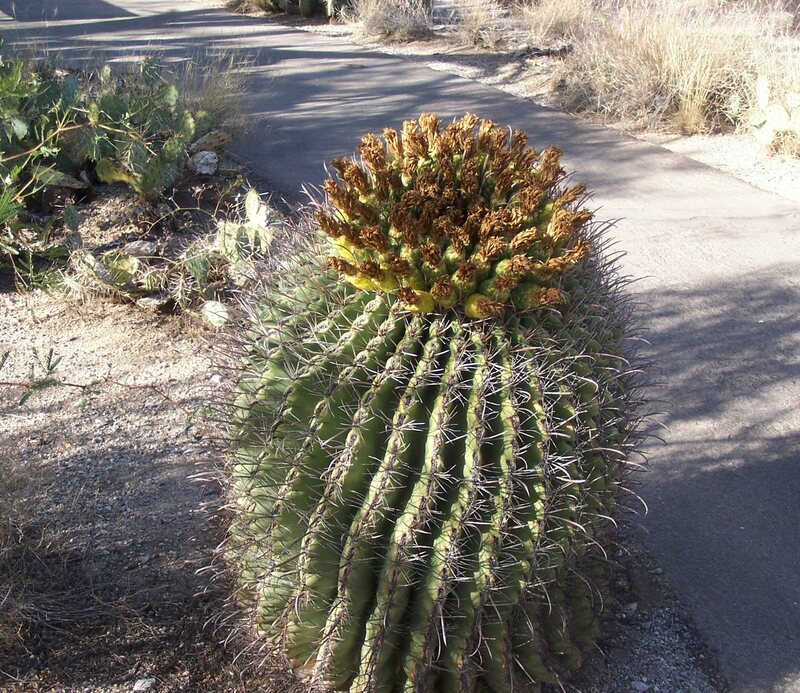 There are many other species of cactus besides the giant saguaro on display; they include hedgehog cactus, barrel cactus, fishhook cactus, teddybear cholla, and prickly pear. From Tucson, get to the East District park headquarters by driving east on Speedway or Broadway, going all the way to Freeman Dr. Go south on Freeman for about three miles and turn east onto Old Spanish Trail, and follow the signs. The park abuts the city limits. Get to the West District by going west on Speedway Blvd; it's about 20 miles from downtown Tucson. About 40 miles to the south lies Tumacacori National Historic Site, and east of that is Coronado National Memorial. 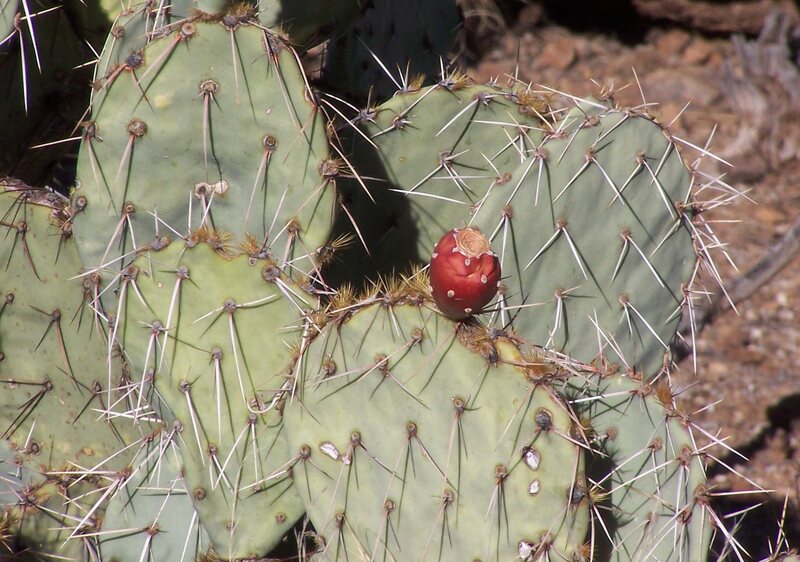 About 60 miles to the east you'll find Fort Bowie National Historic Site, and Chiricahua National Monument. Kartchner Caverns, a state park, is nearby and should not be missed. About 60 miles to the north and west is Casa Grande Ruins National Monument, and Hohokam Pima National Monument. 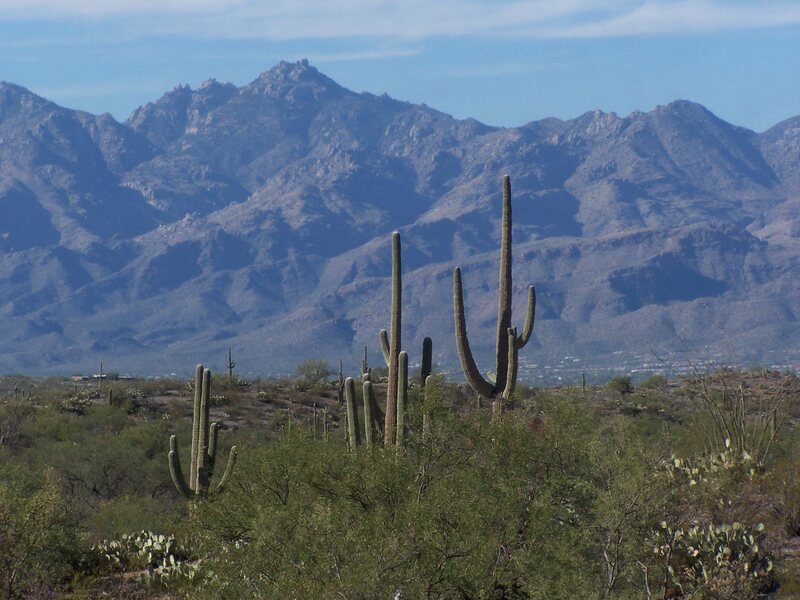 Around 100 miles north, near Roosevelt Lake, is Tonto National Monument. Visited December 2001 and October 2004.